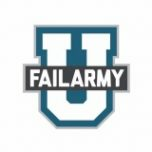 FailArmy is the worldwide leader in funny fail videos and compilations. FailArmy releases “fails of the week,” funny pranks, girls fails and compilations featuring all of the web's best fails. Join the global FailArmy Nation.